This is our coverage of County Durham. The present Durham County Council unitary authority was formed in 2009 with the aboliton of the district councils of Chester-le-Street, Derwentside, City of Durham, Easington, Sedgefield, Teesdale and Wear Valley. Darlington Borough became a unitary authority in 1989 but remains within County Durham for ceremonial purposes and some services are shared. See separate pages for the maps of Gateshead, Sunderland and South Tyneside, which became part of Tyne & Wear in 1974, and for Hartlepool and Stockton-on-Tees which became part of the short-lived Cleveland county in 1974. These all remain unitary auhorities. 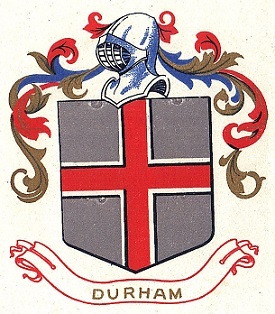 For a summary of Durham's local government history visit This Page. All maps are available from our On-line Mapshop. All maps are very detailed and each includes an introduction. 21.09 Easington Lane & South Hetton 1896 - published 2005; intro by David Butler. 35.15 Bishop Middleham & Mainsforth Hall 1896 - published 2007; intro by David Butler. 20/21 Tyneside & Wearside 1878 This map is double-sided.